The DFMCH welcomed 37 new residents (including the six new Wausau residents above) in July. 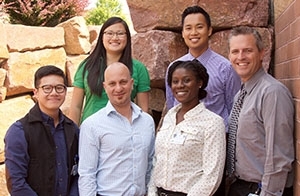 On July 1, the Department of Family Medicine and Community Health (DFM) welcomed 37 new residents in its department-managed and affiliated programs statewide. It also said goodbye to 37 graduating residents, 23 (62 percent) of whom will enter practice in Wisconsin. Learn more about each program’s incoming and graduating residents below. 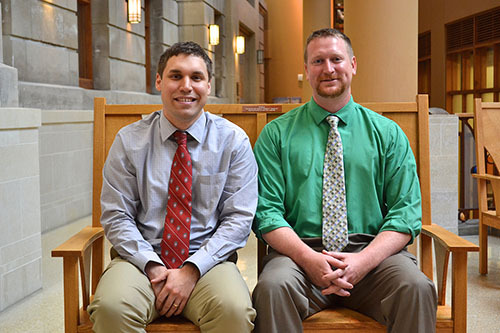 The new Baraboo residents, from left: Paul Stevens, MD; Mathew Herbst, MD. Both incoming residents are graduates of the UW School of Medicine and Public Health (SMPH). One resident worked as a physical therapist in Portage, Wisconsin before entering the SMPH’s Wisconsin Academy for Rural Medicine program; his medical interests include sports medicine and musculoskeletal injury care. ·The other incoming resident volunteered medical services to underserved populations in Madison and helped promote medical careers to middle-school children. He also enjoys drumming and was a percussionist with the Civic Symphony of Green Bay for nearly a decade. One graduate will stay in Wisconsin to begin her practice in the Spring Green area; the other will travel to Seattle to complete a fellowship in advanced obstetrics. The new Eau Claire residents, from left: Amy Sorensen, DO; Raheel Naseeruddin, MD; Michael Albano, DO; Michael Dawson, MD; Krissi Danielsson, MD. 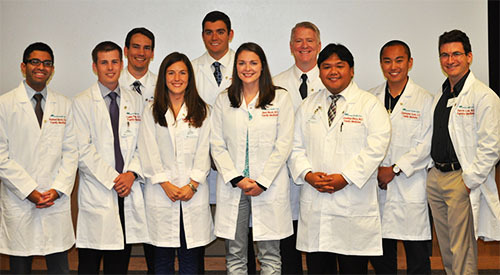 Two of the program’s incoming residents are doctors of osteopathic medicine. Three incoming residents are from the Midwest: Kalamazoo, MI; Park Ridge, IL; and Mankato, MN. The remaining two are from the West Coast: Monterey, CA; and Prince Rupert, British Columbia, Canada. The new residents have diverse personal interests, including computer programming, outdoor sports, playing the Celtic harp, martial arts, and container gardening. One graduate will enter practice in Wisconsin, at the Krohn Clinic in Black River Falls. The remaining graduates will practice outside Wisconsin. One has accepted a family medicine position in Kansas City, KS; one will fill locum tenens positions in Oklahoma, Texas and Louisiana; and two will enter practice in Toronto, Ontario, Canada. As of July 1, 2015, the Fox Valley residency program is no longer administered by the DFMCH. Four graduating residents are entering practice in Wisconsin: in Appleton, Greenville, Waupaca and Lake Geneva. One graduate is entering a sports medicine fellowship in Billings, Montana. One graduate will enter practice in Otautau, New Zealand. The new Madison residents. 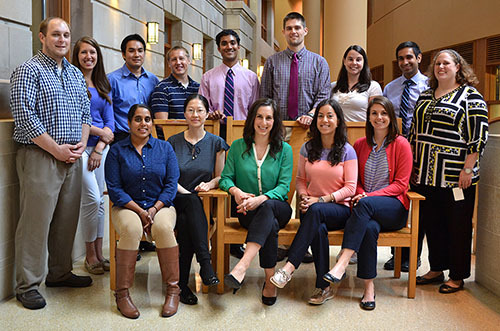 Back row, from left: Lucas Kuehn, MD; Anna Chase, MD; Yoshito Kosai, MD; Andrew Maiers, DO; Mukund Premkumar, MD; Matthew Brown, MD; Lauren Walsh, MD, MPH; Milap Dubal, MD; Ellen Gordon, MD. Front row, from left: Divneet Kaur, MD; Lydia Chen, MD; Allison Couture, DO; Tina Ozbeki, MD; Katherine McCreary, MD. Incoming residents have volunteered their time and services at free clinics, community health organizations, public health departments and organizations such as Reach Out and Read and the Peace Corps. During medical school, one resident traveled to Washington, DC, to advocate for health policy changes as part of DO Day on the Hill. Incoming residents have a deep commitment to health education: one served as the SMPH’s “Health Care in Diverse Communities” course coordinator; one coordinated nutrition counseling at the Tufts Outreach Nutrition Education program; and one created a “Distinction in Global Health” recognition for medical students and developed health education courses for refugees. Nine of Madison’s 13 graduating residents will enter practice in Wisconsin. Five graduates will enter UW fellowships: one in the DFMCH’s academic fellowship; three in the DFMCH integrative medicine fellowship; and one in the DFMCH/Department of Pediatrics primary care sports medicine fellowship. One graduate will enter the Heal Initiative Global Health Fellowship, a two-year fellowship in which time is split between Chiapas, Mexico and the Navajo Nation in Shiprock, New Mexico. The new Milwaukee residents. Back row, from left: Scott Chandlers, DO; Christopher Peters, DO; and Larry Sorrell, MD. 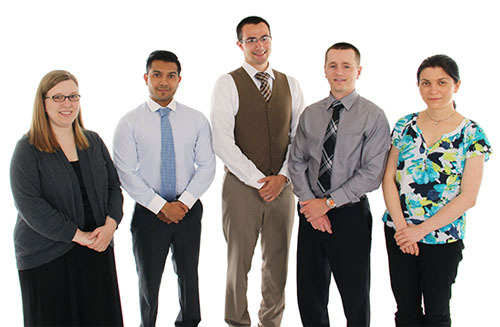 Front row, from left: Raheel Mody, DO; Caleb Patee, DO; Kristin Dement, DO; Sara Nixon, MD; Jonathan Blaza, MD; Christopher Cook, DO; Devin Lee, MD. Six of the 10 incoming Milwaukee residents are doctors of osteopathic medicine. The new Milwaukee residents received medical training at schools in seven U.S. states: California, Illinois, Oregon, Washington, Iowa and Florida. One of the incoming residents received a Gold Humanism Honor Society Award; three have participated in medical missions; and one is a marathon runner. Outside of work, incoming residents enjoy sports, running, working out, camping and music..
Four of the graduating residents are staying at Aurora Health Care to practice. Two residents are moving to their hometowns in Iowa to practice; two will be practicing in Madison, Wisconsin. The new Wausau residents. Back row, from left: Danielle Fenske, DO; and David Cao, MD. 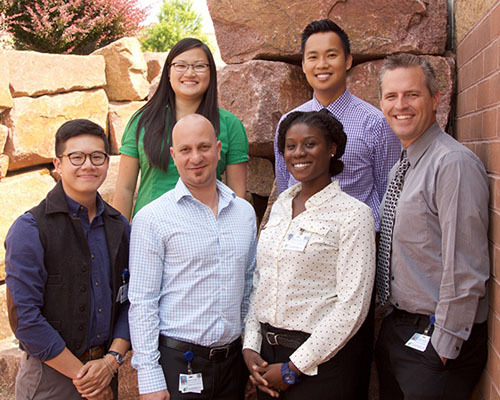 Front row, from left: Justin Hwang, DO; Hamid Assadi, MD; Rose Griffin, MD; and Sean Huff, DO. Incoming residents’ experience prior to medical school or residency includes working as a research coordinator, completing an MBA and visiting all seven Wonders of the World, earning an MPH, volunteering as a full time social worker for a homeless shelter, working in construction management, and renovating a vintage Airstream trailer. Outside of work, incoming residents enjoy playing musical instruments or singing, participating in sports, mentoring children, travel, theater, classic cars, homesteading, and restoring vintage automobiles. Two graduating residents will remain in Wisconsin, practicing at Aspirus locations in Wausau and Antigo. One graduate will practice in Springfield, Missouri. Two graduates have not yet finalized their practice plans.